Walked approx 0.75 miles of the beach. 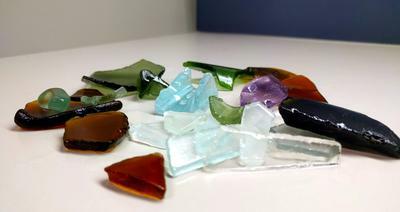 Found about 25 pieces of sea glass. Most were about quarter size, but some were half-dollar size or larger. Most edges were worn smooth. Colors included: Green, clear, blue, red, black, and purple. Beach is safe and is directly adjacent to a popular walking path. There is also a nice assortment of coral and shells on the beach.